The Zimmer Cryo 5 Evaporator uses the heat around it to produce and deliver (continuously during treatments) – 30C degree temperature via the Zimmer Cryo 5 Hose. 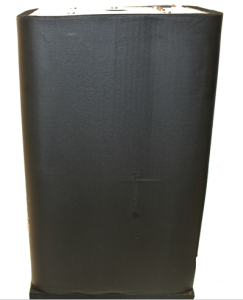 The Cryo Five draws in air from the treatment room by the six speeds of the Therapy Fan, and than removes the heat, and releases chilled therapeautic air. The Zimmer Cryo 5 has a single-phased, refrigerated circuitry system. By process of vaporization, the Zimmer Cryo 5 Evaporator changes the state of R 507 refrigerant from liquid to gas. By absorbing heat from the air in this unit, the Zimmer Cryo 5 Evaporator works the opposite of the Cryo 5 Condenser. By the time the R507 refrigerant reaches the Cryo 5 Evaporator it is has been reduced/lowered by the expansion valve, causing heat to withdrawal and making it much cooler than the air circulating around it. By withdrawing heat from the Zimmer Cryo 5 Evaporator, the ambient room air drawn in through the Cryo 5 Filter (backside of the Cryo unit) by the Therapy Fan can now be available as chilled therapeautic air. At the bottom of the Cryo 5 Evaporator housing an opening for defrosted water can be located. The defrosted water drainage is collected in a condensation collector bucket which is located in the back of the Cryo 5 unit. Once the R507 refrigerant reaches the Zimmer Cryo 5 Evaporator, it is in liquid state and is now used to absorb heat from the product. When leaving the Cryo Five Evaporator, the R507 refrigerant has absorbed a volume of heat from the product and is now a low-pressure, low-temperature vapor. This low-pressure, low-temperature vapor is then drawn from the Zimmer Cryo 5 Evaporator by the Cryo Five Compressor. 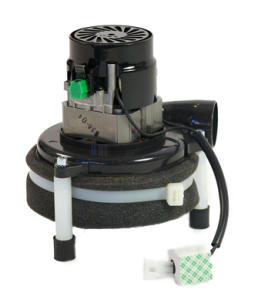 The Cryo 5 Compressor raises the temperature of the vapor and in-turn increases the pressure. This compression action transforms the vapor from a low-temperature vapor to a high-temperature vapor. This high-temperature, high-pressure vapor is than pumped from the Zimmer Cryo 5 Compressor to the Cryo 5 Condenser; where it is cooled by Cryo 5 Condenser Fan and surrounding air. The vapor within the condenser is than chilled to a point were it becomes liquid once more. The heat, which has been absorbed, is then freed to the outside air. At this point in the refrigeration cycle, the liquid R507 refrigerant is than passed through the Zimmer Cryo Five Expansion Valve. The Cryo 5 Expansion Valve reduces the pressure of the R507 refrigerant and therefore reduces the temperature. The refrigeration cycle is finished when the R507 flows into the Zimmer Cryo 5 Evaporator, from the expansion valve, as a low-pressure, low-temperature liquid. The Zimmer Cryo 5 Therapy Fan plays function plays an important part to the performance of the Cryo 5 Evaporator. The Cryo Five Therapy Fan does not only draw heat-laden air into the Zimmer Cryo 5 Evaporator, but it also forces this air over the evaporator’s fins and coils. Once the air is delivered over this area, the heat becomes surrendered to the refrigerant and than cooled air is pushed out of the evaporator and into the Zimmer Cryo 5 Hose. The Zimmer Cryo 5 Expansion Valve controls the flow of the liquid R507 refrigerant into the Cryo 5 Evaporator. The Cryo 5 Thermostatic Expansion Valve assists in the reduction of the pressure and temperature of the system. 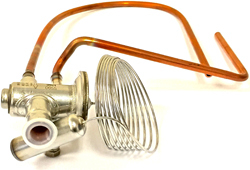 This valve also controls the superheating at the outlet of the evaporator, and is responsive to the temperature of the R507. Expansion valves are flow-restricting devices that cause a pressure drop of the working fluid, and are generically referred to as metering devices. The Zimmer Cryo 5 Combi Drier function is to filter out particles and any type of debris, and to remove moisture to prevent unwanted vapor from circulating throughout the refrigeration system. The Filter Dryer prevents blockage of the expansion valve. 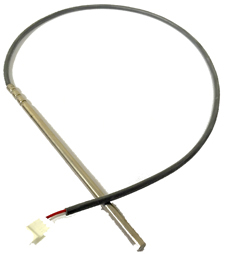 The Zimmer Cryo 5 Evaporator has a long and short sensor that can determine the temperature inside the evaporator. The evaporator must meet a certain load and temperature in order for the Cryo operator to start using the Cryo 5 unit. The Cryo 5 Evaporator Sensor connects inside to the Board of the unit. Zimmer Cryo 5 Evaporator is to be purchased only for the Cryo 5 chiller. The Zimmer Cryo 6 has a different evaporator. The evaporator should be installed by only licensed and certified technician.When replacing the Cryo 5 Evaporator one should consider replacing the Filter Dryer and Expansion Valve as well as the Short and Long Sensors. 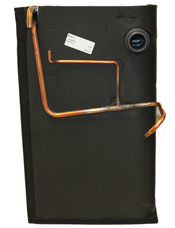 The Zimmer Cryo 5 Evaporator is purchased here separately from any other item(s).